I hate it when I have to download a few apps to perform simple tasks. 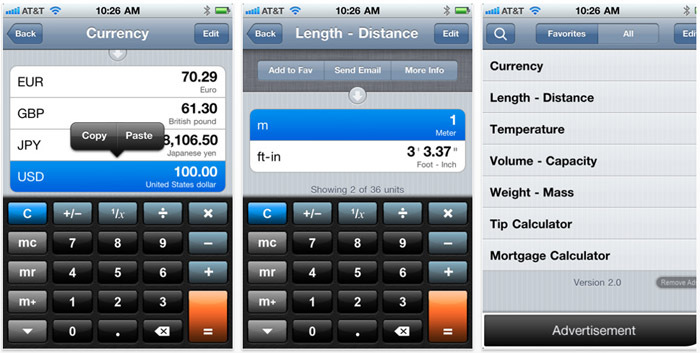 I used to have a calculator app, a currency converter app and a an app for units of measure. No more! Converter Plus for iPhone has all these features and more, I can clean up my phone and still somehow get more info out of this app than all the others. So what is awesome about Converter Plus? The sheer amount of stuff it does for one. 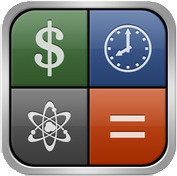 It allows for conversions for things like: currency, speed, temperatures, computer data, cooking volumes, and weights. Not only that, but it also has a standard calculator included. My favorite feature is that I can keep a list of favorites. So any common conversions I make I now have in an easy to access list, I don’t need to perform a new search each time I need the info. Click here to download the app, for free!